Davenport: I undertstand you like to fight. Antwone Fisher: It is the only way some people learn. Davenport: But you pay the price for teaching them. Perhaps the main reason that men are afraid to admit that a film moved them to tears is that most often the subject matter is nothing more than melodramatic romanticism. The mark of a well made film is one that touches the viewer by telling an inspirational story of adversity and triumph. When one such as this moves me to tears, I consider it terrific filmmaking. In recent years, only two films had moved me so emotionally that I found myself crying as the credits rolled: Tthe first film was Phillip Noyce�s Rabbit-Proof Fence. The second and more surprising was Denzel Washington's Antwone Fisher. To experience the full impact of its emotional power, it helps to understand the history of bringing this true life tale to the big screen. The real Fisher was, after the slightly fictionalized events of the film, working as a security guard at the Sony Pictures lot in California. Having written a script based upon the events of his life, Fisher soon drew the interest of actor Denzel Washington, who was looking for a film with which to make his directorial debut. Soon Antwone's story of triumph and pain would be seen by everyone. When we first meet Antwone (Luke), it is in a dream sequence of startling power. When Antwone wakes he is aboard a US Navy ship, docked in San Diego. Antwone is prone to uncontrollable anger and is constantly getting into fights for seemingly no reason at all. His latest altercation has landed him in the office of Navy psychiatrist Jerome Davenport (Washington), where he must receive counseling rather than being discharged from duty. At the same time, Antwone is enjoying a flirtatious relationship with fellow enlistee Cheryl (Bryant), who tries slowly to bring Antwone out of his shell. But what was it that kept Antwone bottled up in the first place? As Davenport gains Antwone's trust, the doctor slowly learn of the young man's dramatic childhood in which he was bounced from once foster home to another, where he endured horrible abuse, both mentally and physically. Eventually, Davenport convinces Antwone to return home and seek out those who caused him so much pain to gain closure. The idea of mental and spiritual triumph over pain is central to the plot of Antwone Fisher, and yet the film offers so much more within its deeper message. Through his discussions with Antwone, Davenport comes to terms with his own failing marriage while also helping Antwone find direction. At times, it seems as though the pair are counseling each other; Davenport mends a relationship that has fallen apart with time while Antwone works hard to begin one with Cheryl. When the filmtakes us back to Ohio and Antwone's past, we see our protagonist piece his life back together, yet it does somewhat take away from the comfort found in the chemistry of earlier scenes. It would be easy to dismiss this story as typical TV movie-of-the-week fare and, to be honest, the uplifting and overly touching subject matter makes it perfect fodder for such stereotypes. What separates Antwone Fisher is the perfection of its performances. Luke, who worked at the Sony gift shop for several years before getting his break in acting here, is a revelation as Fisher and his scenes showcase power and restraint so well that it is difficult to believe that this was his debut feature. There are scenes of unbridled emotion that Luke pulls off quite nicely, including an emotionally-charged speech towards the close of the film that will likely move anyone with a soul to tears. Behind the camera, Washington does a fine job in his first outing as director. What Washington does that elevates both his work and the film as a whole is that he restrains the action from becoming too melodramatic. There are numerous moments where the subject matter becomes an easy target for this, but Washington and Luke each offer such heft and intensity that they never become overly sentimental. Image Transfer Review: Presented in an anamorphic 2.35:1 transfer, Antwone Fisher offers a basically great transfer though there are flaws that distract from the overall quality. Sharpness and detail are good, though there were a few moments where the transfer appeared to be a bit soft. Edge enhancement did appear from time to time, but it never mcuh of a problem. Colors are nicely done, though the film offers a very subdued color palette. Overall, this is a fine transfer with only a few small flaws. Audio Transfer Review: The soundtrack for Antwone Fisher is rather typical of a dialogue-driven film in that the center channel offers a large portion of the action while the surround speakers are used rather sparingly. The surround speakers are used mostly for the score as well as ambient sounds such as thunder. Dialogue sounded fine with no distortion or harshness, while the .1 LFE track was given very little to do. Extras Review: I believe the DVD release of Antwone Fisher marks the first time actor Denzel Washington has recorded a commentary track, and he is joined by producer Todd Black. They share a great energy throughout as they discuss the making of the film as well as various other points of interest. Washington speaks the lion's share, in which he admits to stealing from various directors he has worked. This is a very enjoyable track that offers a lot of information about the life of Antwone Fisher as well as the feature presentation. Two documentaries are offered, the first of which is Meeting Antwone Fisher, a fascinating look at the life on the title character . The documentary deals largely with how his story was carried over into the film, as well as how his time in the Navy helped him to grow as an individual and come to peace with his past. Making Antwone Fisher is a look at the making of the film that is in line with other promotional pieces; it features interviews with everyone and anyone involved. It is fun to see Washington discuss the casting and other decisions, but overall this piece seems promotional. Hollywood and the Navy chronicles the partnership between the Navy and the filmmakers. Most interesting is the effect of 9/11 on the making of the film, given that the crew was shooting on a Naval ship on the previous day. Worth a look indeed. Finally, trailers for Drumline, Le Divorce, Master and Commander, and In America round out the extra features. 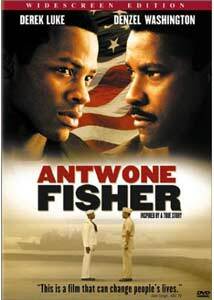 Antwone Fisher is a film that deals with universal issues—loss, family, love and, above all else, trust in both yourself and others—and handles them in a simple and eloquent way. Unfortunately, the film was all but ignored upon its original theatrical release as well as during the award season. Newcomer Derek Luke offers one of the best performances in recent memory and that alone makes Antwone Fisher an easy recommendation.